Tea Is For Turtle: Giveaway! Turtle has some good news, he has decided to host his very first giveaway. This is the first time that Turtle has made a tote bag, the first of many he hopes. It features an original design of, well, a prawn. He adores it and would happily stare at it all day. Turtle loves a good pun, and a bad pun in fact, sometimes the bad puns are the best. This is your op-perch-tuna-ty to have a whale of a time! Leave a comment with your best fishy pun. Simple! Go on, just for the halibut... (snigger). If you need some inspiration have a look at the uncyclopedia page on fish puns. You can get an extra entry for blogging, tweeting or facebooking about Turtle's giveaway. Just pop another comment on when you do. The winner will be picked at random and will be announced on Friday the 19th of February at 10pm. That is fishy? Cod it be people are too scared to comment? ...Well my name is Prawn, and I would love a dawny, I mean prawnie bag! Then a bag with a Stag. salmon will have to comment again soon! I adore that bag (I'm a bag freak) and I haddock to win! This bag has found a plaice in my heart! Would look great with 'Be a Little Shellfish'?!? (A-whale-able to perch-ase on Folk-sea) ...Shameless self-prom-ocean, sorry. Ooh Turtle has taste :: I need to crab myself one of those :: Hope it won't shrimp in the wash!! 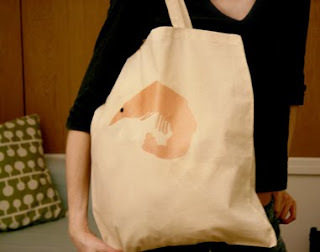 This bag would "sea food" beacuase i would love it as a grocery tote. Ok that one was bad. These fish pun are welcome any day "barramundi"
I've given you the Sunshine blog award. Visit my blog for the details! I am so not good at puns..but tonight as I was getting ready for Valentines dinner I realized that my dress looked better with EELS than flats. 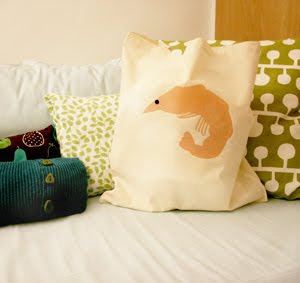 I had schooled myself to scale back and make do with my current collection, but who could resist such a swish prawn? One more tote won't gill me, right? This bag will be a hit with my fronds! I took some time to mullet over, and that's all I could come up with! I lost my daughter today. I flounder in the toy section of the store we were in. I used to be a waitress and had a lot of senior citizens come in - we lovingly called them the schrod-squad! Are you baiting your readers? I've got sole but I'm not a solider...just a student that would love to use this to tote my books! I'd look fin-tastic if I had this bag to use! oh Pollack*s I'm rubbish at this sort of thing i just clam up. Hope this qualifies: "What did the fish say when he ran into the concrete wall? Damn!" I hope I will fin-ally win a giveaway. I guess I'll have to tuna back in to see if I did! I'm fresh out of cod-darn puns! I guess my fate is sea-eeled. All of my puns are carp... I hope I've left my shark on this blog -- If you don't laugh at these, you have no sole! Have just blogged about the giveaway - only a couple of dace left to pun! Coincidentally, my husband and I were just talking about fisheries this morning! There are real problems with fishery management, you know, because they can't be made to work with economies of...scale. Thank you for doing this giveaway, thus enabling me to find and follow your blog. Anyone who goes trawling for puns this way must be read! what is the SEAHORSE of your inspiration? your blog is simply the BASS! What do you call a fish with no eyes??? ?